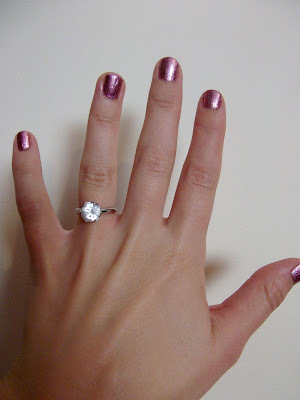 I'm currently keeping my nails short and am happy to be rekindling my love for nail polish! I'm not a big fan of long nails that are painted anything other than clear or in a French polish, so I don't usually experiment at all when I wear them long (which is 90% of the time!) But I do love short nails that are painted all kinds of colours...I don't know why I'm this way but I'm sure I'm not the only one, is anybody else the same about long/short nails and how they're painted?! 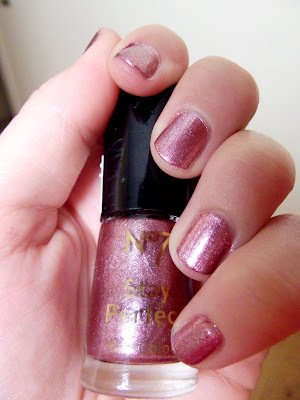 Anyway, here I'm wearing my favourite colour for autumn which is No.7 Stay Perfect in the shade Milan. It's a metallic silvery purple and it's really great quality. It also dries quickly, which is a major plus for me because I ALWAYS forget to wait long enough and end up smudging my nails! Another nail polish related habit I'm particular about is never, EVER matching my fingers to my toes!! I hate matching. I just can't stand it because I feel like where's the excitement in that?! How boring would it be to look at a girl's nail polish and automatically just 'know' that that's the colour she's wearing on her toes as well? I always like to keep people guessing...it's more mysterious! Maybe I'm reading too much into this but, hey...that's how the mind of Anna works!! 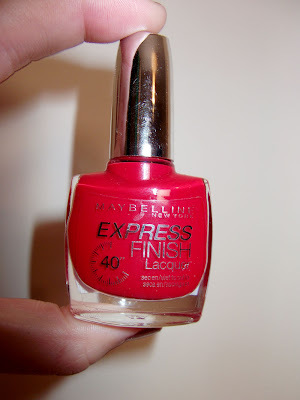 So I painted my toes a true red, Maybelline Express Finish Lacquer in Cherry. Normally in the autumn/winter I go with navy blues/browns/blacks on my toes but I felt like they needed a change and this nail polish dries in 40 seconds! Yay!! That way your tootsies don't get cold for too long, hahaha. I'm the same way about painting my toes and fingers in different colors, more fun that way:) I think the thing about short nails in colors is that they're more chic whereas long nails in colors tend to look more trashy, totally depends on the color and the shape of the nails though. Anyway love your blog Anna. xoxo. :) i feel the same about pictures of feet! And I make it a rule to never match either, I don't the 'tried too hard' look! Have a Super Sunday ahead! i bet your feet are freakin' amazingly gorgeous. i hate you. @Inga Yeah you're absolutely right..that is the reason! @Parisa Yes it's a great shade for that extra bit of bling! @Liesl Hehe, I'm with you on the feet thing and glad you understand! I think it looks more visually appealing if you have two different colors on your toes and nails. Though I wouldn't do something completely different like yellow nails and blue toenails - lol. I always have liked short nails. I have tried to go long but always clip them off within a day. I hate how they chip so easily and are hard to keep up the maintenance! I LOVE the shade of your nail polish! I must head over to the drug store first thing tomorrow morning! And I feel exactly the same way when it comes to feet! Except, I don't mind seeing other peoples feet but when it comes to mind I hate having them photographed. I am sure you have very nice feet, but I can understand where you are coming from! Speaking of feet, there is this boy in one of my english classes that NEVER wears shoes. In those cases then I do mind seeing their feet! I have never asked him why, but I have never seen him wear shoes! I hate matching nails and toes, too!! Like you said, is so boring. I really like your nailpolishes and I also like wearing them just when my nails are short. They look gross when they are long and painted but it's just my opinion. Hi, I feel exactly like you when it comes to nail length and polishes. I keep my nails short most of the time though because I play an instrument. But when I want them long for a special occasion I use press on fake nails in a french manicure style. The big trend this fall are khaki colours, see the new Chanel collection! You're right, colourfully painted nails really do look better when they're short... I just realised that myself recently. I'll have to try out that red nail polish- I'm currently looking for a really good red nail polish but it's SO hard to find one! I've tried so many but for some reason they never cover evenly, and when you put on another coat it just looks too dark... And never dries... Really annoying! I'm the same way Anna. If the nails are long then I opt only for white tips. Otherwise, I love to experiement with all sorts of wild colors as long as my nails are short!